An acoustically powered pumping device with 250 micron long oscillating structures driven by a piezoelectric transducer mounted on a glass slide. Imagine a world where tiny pumps could be used to determine whether or not someone is carrying a disease. The results would be available in minutes instead of a few days or more — the whole procedure could take place in the duration of a doctor’s appointment. Welcome to the future where a lab-on-a-chip device can give you the information you need when you want it — now. The field of microfluidics and lab-on-a-chip technologies has the potential to revolutionize the healthcare industry with cost-effective, high-performance miniature biomedical diagnostic devices. Despite its tremendous potential, the field has only delivered very limited numbers of products and tools for real-world applications. One of the reasons is that it is difficult to fabricate micropumps that are simple and inexpensive, yet reliable and effective. The research group used an effective design for the microfluidic device to prove that low powered acoustic waves could transport fluids with accuracy and consistency. The total cost to construct the device is $20-30, with the disposable chip itself costing just 10 cents. The cost is somewhat higher than paper diagnostic counterparts such as pregnancy tests, but is much more accurate and flexible. Therefore, it can reliably provide assessment measurements for diseases including — but not limited to — HIV, cancer, infectious diseases, and cardiovascular disease. Today’s diagnostic technology is expensive. In the U.S., it can cost as much as $800 for a diagnostic test. 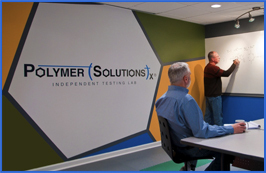 The price includes the cost of the equipment used and highly trained lab technicians to gather and interpret the results. This disposable-chip technology holds the promise of one day bringing down the cost of health care with a device that is inexpensive, user-friendly, and at the same time, dependably accurate. Future battery-powered versions of the device could bring low-cost, precise, disease diagnosis to regions where electricity is not available. Our pump is quite unique. It’s reliable and programmable, with a minimum of hardware, yet highly precise. The flow rates can be tuned across a wide range, from nanoliters per minute to microliters per minute. I don’t see anything out there with our characteristics. A device like this could significantly reduce the high-cost of health care and the need of lengthy waits for vital, life-changing results. Furthermore, it can offer quick, accurate and consistent results to people around the world who don’t have access to electricity let alone doctors and diagnostic tests. Not only might this device revolutionize the health-care industry, it has the potential to impact the health of people around the world. Image: Po-Hsun Huang and Tony Jun Huang, Penn State. Video by Penn State University MRI, youtube.com. Source: “A Reliable and Programmable Acoustofluidic Pump Powered by Oscillating Sharp-Edge Structures,” by Tony Huang, et al., Lab on a Chip, September 04, 2014, DOI: 10.1039/C4LC00806E. Source: “Cost-Effective, High-Performance Micropumps for Lab-on-a-Chip Disease Diagnosis,” Materials Research Institute Penn State, www.mri.psu.edu, September 4, 2014. 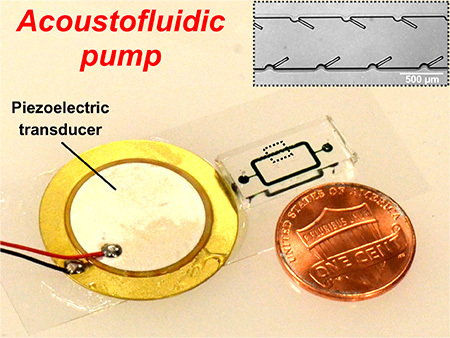 Source: “Microfluidics and Lab-on-a-Chip Technologies Help Develop Piezoelectric Transducer-Powered Acoustofluidic Pump,” Azonano.com, www.azonano.com, September 5, 2014. Source: “Cost-Effective, High-Performance Micropumps for Lab-on-a-Chip Disease Diagnosis,” Newswise, www.newswise.com, September 4, 2014.